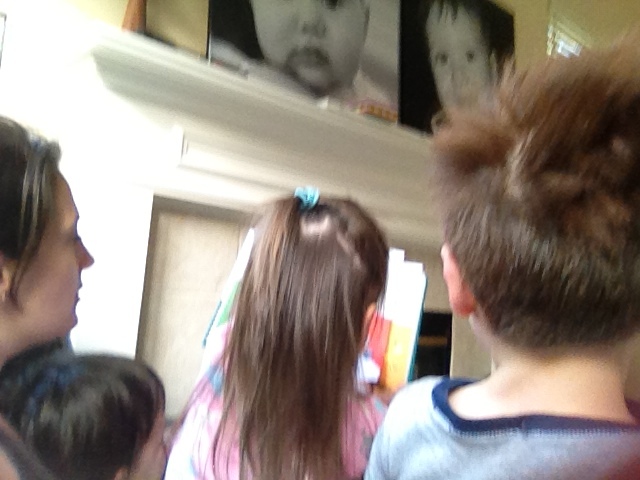 I read a book to Twin Husky, Twin Crazy, and Big Bro. I started with Twin Husky since he needed some cuddle time and then came Twin Crazy, and then Big Bro… Red was having a problem so she did not join us. Co-parent left Red sulking so I went over to see what the problem was. She wanted a containter of cereal to take to school with her. While I was at it, she said she wanted a bowl of cereal to eat now. 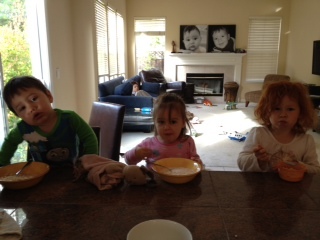 Then before I knew it I had the others back at the breakfast bar eating a second breakfast with me. Their bellies were good and full. I kissed Big Bro before he left on his bike and did the drop offs – no problems. Red was a bit clingy. I finished up a discussion / sales document for a forum we are launching and also crafted the email communication. I confirmed with members from the other forums that the potential dates for October will work with them and that there are no conflicts. I packed up the minivan with more stuff from my room. The room is looking VERY bare – no decorations… hardly any clothes… just my bed, my dresser, Batman’s cage, and piles of books and papers. I headed to Home Depot and bought a drill, a cherry tree (Yeah! It was on our list! ), some tools, grass seed, weeding tools, some houseplants, and other stuff. I feel like I’m on a learning curve and the drill intimidates me a bit. But I think I need one. 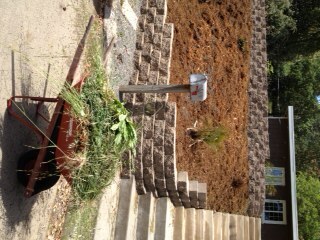 I got to the house and unloaded, organized a bit inside, organized more trash/trimmings, and WEEDED more…. yes more…. unbelievable. But it is getting respectable again. It actually feels good since I feel like I accomplished alot of weeding in a relatively short amount of time… I concentrated on the EASY to pull weeds (now I know the difference and can spot the easy ones very quickly). Ha! I loaded up my dumpster and also a huge box, which I packed back in the minivan to throw away at the “old” house. I picked up the kids; Red was happy. Twin Husky and Twin Crazy wanted to show me how they ride their tricycles. Twin Husky can actually use the peddles. 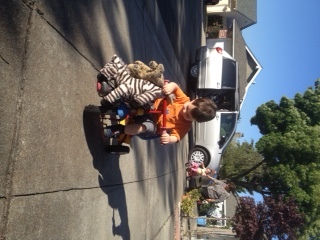 He was so determined… his face was so serious as he was “driving” his tricycle. He also had all three of his animals in his hand (“Tiger”, “Other Tiger”, and “Zebra”) which was hysterical. Twin Crazy is using her feet on the ground to get around but she’s quick. She was also very proud of herself and I encouraged her along with her brother. I had Twins for bedtime; bedtime was rough tonight. Red was crying non-stop; co-parent let her cry it out. Eventually he went to her. Her knee was hurting. She came to my room. She just wanted a bandaid. She became happy as soon as I got them for her. How is he going to do this on his own? How long are the children going to cry with him not listening to them?????!?!?!? I finished the evening with more work. I sent out the “sales” document to the potential clients over a series of emails. I also reviewed our Final deliverable for our client and I’m hoping it will get sent out tomorrow. I’m looking forward to tomorrow with Twin Crazy and Twin Husky. I am going to focus on getting my room organized since there are boxes everywhere. If I can bring over my dresser by myself, I’ll be able to cover a lot of ground.